Last night George Walker drove up after getting settled in at Lie-Nielsen for his class this weekend. Because of his flight times and the hour and a half drive to my place from the Toolworks, we got a quick dinner and headed straight over to the Fisher house before we started losing too much daylight. There are no lights in the 1814 part of the house so we needed to proceed at a hasty pace. As the sun tucked beneath the tree line, my flashlight became increasingly important. It was a curious thing showing him the construction details in the dark. Because, at the end, all we had for light was one single flashlight I saw things I’ve never seen before. 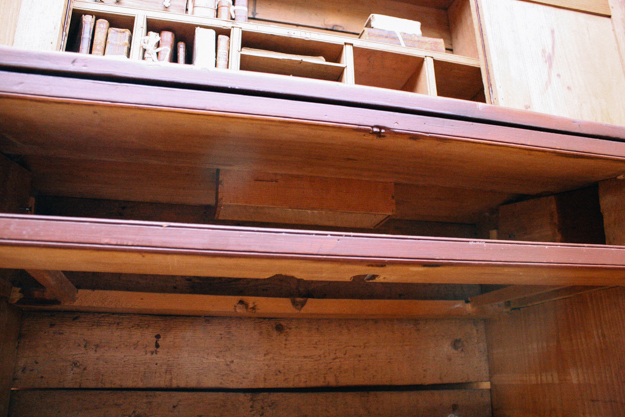 The way the secret compartment box was attached under Fisher's desk lid was frankly boggling. There were tons of toothpick sized wooden pins holding it in place. I never noticed that before. There were other curious things too and I am looking forward to reexamining these pieces in more detail soon. 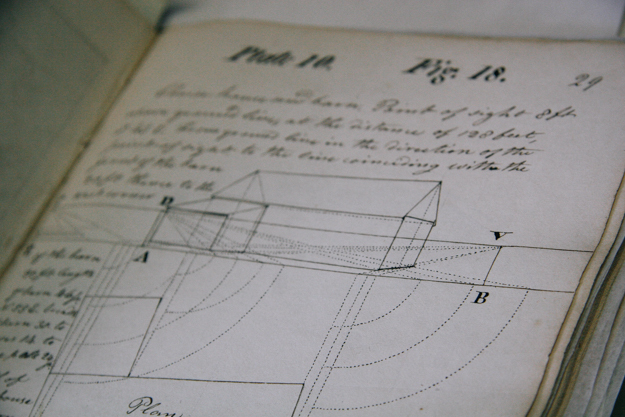 After we totally lost light, I took him into the archives where we looked through Fisher’s 1790-1791 geometry notes from Harvard. This obviously struck a chord with George. As I, for the zillionth time, gave my Fisher spiel I saw again that look of wonder and fascination at the genius and sophistication of this rural minister/artisan. It was great spending the evening with George. We talked about Fisher, period furniture making, writing, teaching, and an upcoming M&T article he’s working on for me (which I’m stoked about, of course). I’m grateful for his fellowship and insights about the Fisher collection. Thanks, George. I look forward to next time I see you. That last pic of the constructed perspective is super interesting to me. Although a musician/musicologist by trade, I also have a degree in architecture and have constructed perspective drawings form plans before... but his method is a bit different. Nice to learn something "new". Thanks for sharing the story and the photographs. So glad you enjoy it! There are mountains of this stuff in the archives! It's interesting but rather overwhelming.